The Twins optioned two players from camp this morning and reassigned four others. Taylor Rogers, J.R. Graham, Buddy Boshers, Carlos Paulino, Buck Britton and Wilfredo Tovar were all shipped out, trimming the number of remaining players to 37. This round of cuts brings more clarity to the bullpen race. Assuming that Fernando Abad and the loser of the fifth starter competition (Ricky Nolasco?) are both in, that leaves one remaining spot in a seven-man unit. Boshers (who I wrote about in yesterday’s notes) was not really a factor in the race, but Rogers and Graham – both on the 40-man roster – were in the mix. The remaining contenders for the job: Michael Tonkin, Ryan Pressly, Brandon Kintzler, Ryan O’Rourke, Dan Runzler. Presumably they’re going to go with a righty, and in my opinion, it’s between hard-throwers Tonkin and Pressly. Who would you like to see round out the Minnesota bullpen? Pretty disappointed that Taylor Rogers was one of the cuts... I guess out of the remaining options I'd choose Pressly to take the final spot. I don't know how you can sell Tonkin to the fans as being one of the better options in this bullpen after the spring he's had so far. Yeah, I'd go with Pressly if it's between those two. Agreed, I like Pressley. But I think Tonkin would be released and sign elsewhere, correct? Probably. That will be fine with me. Don't think he's going to be someone that will haunt the team if he's let go. Dan Runzler, he has stuff and has been good before, also he is another lefty.Give up on Tonkin, he will never make it. Not sure that Abad is a lock.O'Rourke and Runzler did as well as he has done this spring. I'd like to see Duffey in the pen because he has higher upside than the others.Otherwise the 2016 pen will be the same as the 2015 pen that was the worst or second worst in the league. Pressly earned a spot as well. Just a matter with how many lefties they will go out the gate and whether Ryan has the guts to turn Duffey in a reliever to help the team. On a side note, it will be interesting if Nolasco complains about not making the rotation (7.35 ERA and 1.91 WHIP). Aren't we getting to the point where it doesn't matter what Nolasco thinks? We should be well past that point.It has value from an entertainment standpoint though. So, Rogers is still not an option to be the LOOGY? He's a AAAA player as a starter, imo, I don't get this. Does it really matter if they lose Tonkin, given how awesome the RP in AA and AAA are? This concern that you might lose a fringe player has cost the team in the past. I think Tonkin is just a couple tweeks from being a decent reliever. Not a high leverage guy but a serviceable gap-filler to get a couple outs here and there. Swap the sinker for a 4 seem. Honestly what business does a reliever who throws 94-95 have with a sinker? Hopefully Tonkin won't be claimed. The team would have to keep him on the 40-man. Of course, they could always send him thru and chances are he wouldn't be claimed then. Which is the pain of this process. They need to be kept on some roster for a certain amount of time if claimed. Nolasco and Duffey. Maybe one goes. Or they flip-flop in the bullpen. But if Duffey doesn't start up here he'll start at Rochester. I see them going with Duffey out of spring training and IF he has a couple of bad starts, he goes down and Nolasco goes back to the rotation and the Twins have to decide on long-man lefty Rogers or short-man O'Rourke. He won't be released, but he would go on waivers. It'd be interesting to see if he gets claimed. I would think someone might, and that's fine. If he isn't claimed, he can go to Rochester. He's been in the system a long time, if he was a tweak away, wouldn't it have happened by now? and, if that is what he is, why does it matter if they lose him? With all the bullpen arms they have, I don't get why anyone would be worried about losing a guy that MIGHT be a gap filler type. Graham & Pressly - both rule 5 draft guys who stayed on the 25 man roster at the expense of the MLBt eam are now considered as bullpen only guys? Yeesh. If thats right, that seems pretty poor. Hopefully they will keep Graham at least as a Starter in AAA. Abad is a lock. 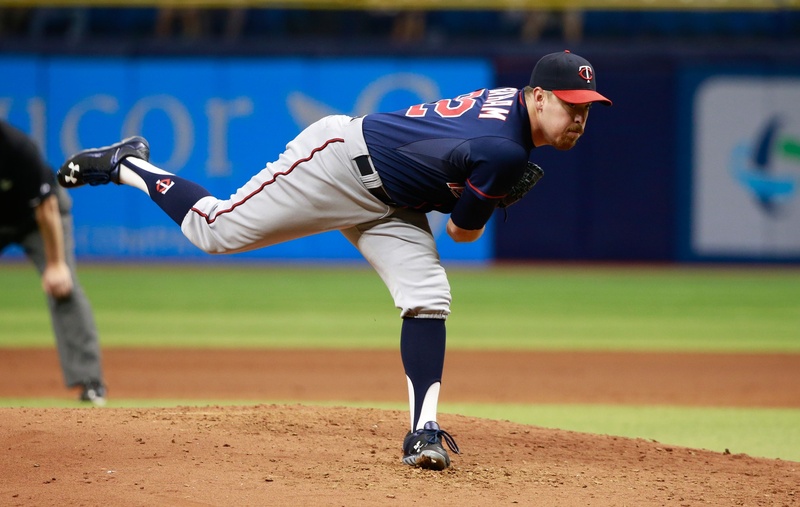 By B-Ref's Opposition Quality measure, he's at 8.8, equal to Perkins and third highest among all Twins pitchers. He was in the pole position before spring training started and has done nothing to lose that spot (and nobody has clearly overtaken him). Runtzler is 7.7, O'Rourke at 6.8. Hopefully, his agent's pre-emptive complaints were the result of really seeing the writing on the wall (Milone and Duffey as virtual locks). The remaining contenders for the job: Michael Tonkin, Ryan Pressly, Brandon Kintzler, Ryan O’Rourke, Dan Runzler. I'd lean Pressly, but I wouldn't be surprised if they try to go with Kintzler assuming they can free up another 40-man roster spot. Pressly earned a spot last year, he was the second best BP arm last year before he went down. If spots were guaranteed prior to spring training, he should have been a lock. I think we are too assumptive that Fein is a lock due to his veteran status. All you need to know is Abad is a Rule 5 pick. He has the safest job on the team. You're probably right. Crain comes to mind as a guy who was a tweak away though. One conversation with John Rauch and his career turned from Crainwreck to Gravy Crain.